Copyright © USA Rugby Football Union, Ltd.
CARY, N.C. – The 2016 USA Rugby College 7s National Championships got off to a flying start Friday, May 27, with 37 matches of pool play welcoming 50 of the 60 teams competing across Memorial Day weekend to WakeMed Soccer Park. All 167 matches from the weekend are being broadcast on The Rugby Channel at no cost to viewers. Saint Mary’s took a stranglehold on Pool A in Men’s Division I with two victories, but Pools A, B, E, and F each contain two two-win teams to set up an interesting Day Two, where eight Cup Quarterfinalists will be determined. The Gaels will have an extra edge to their game this year following an early exit to 2015’s College 7s and a dropped D1A Final just a few weekends ago. Despite winning last year’s DII College 7s Cup Final at University of Denver, James Madison was handed a rough welcome to the DI competition by Davenport and Texas A&M. The Panthers shut out the Dukes, while fellow D1A Rugby Mid-South representative Lindenwood gave Fordham a taste from the top with a shutout of its own in Pool B. A young San Diego State team opened the day with a draw with Oklahoma before a shutout at the hands of Bowling Green, though the Aztecs could still make a case for second in Pool D with a win and help Saturday. “First game we didn’t come out strong at all, played down and didn’t play clinical rugby,” Aztecs captain Austin Switzer said. “We didn’t really run what we were supposed to run as far as the game plan goes. I think we probably should’ve won but that’s the way the ball falls. Men’s Division II 15s National Champion Minnesota-Duluth began its path to a second title of the 2015-16 season with a balanced showing against upstart Niagara, conceding a single try. Fifteens runner-up – and not for the first time – Wisconsin-Whitewater kept pace with its DII rival with a sizable win of its own against Texas-San Antonio, while newcomers Lindenwood-Belleville and UMass Lowell kept themselves in the race for a spot in Saturday’s Cup Quarterfinals with a draw in their matchup. Tulane’s women’s team won the DII Spring Championship last month, but the men’s team did not have similar success on Day One in Cary. Principia showed the kind of form that won the Thunder Chickens the first Men’s DII title in 2013 with a heavy defeat of the Green Wave, which faces a daunting road to the Cup Quarterfinals in Pool B. 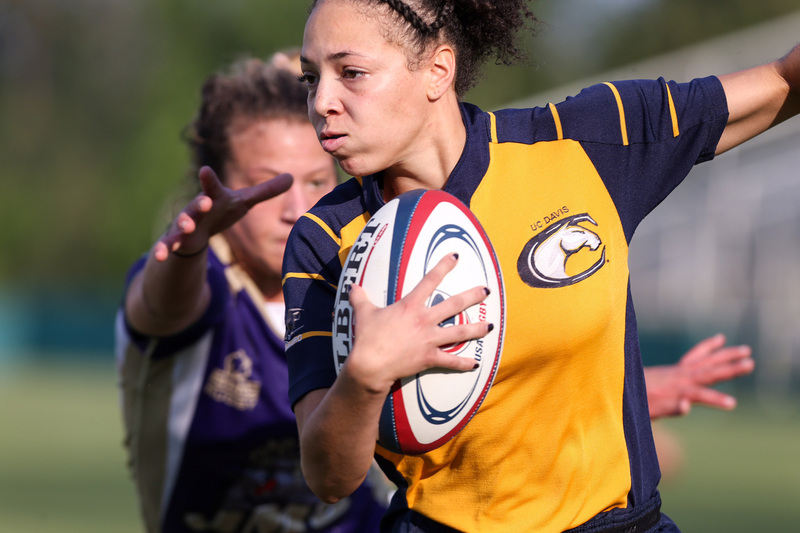 While the nine-team DII competition does not start pool play until Saturday, 10 of the 11 Women’s DI teams got 14 minutes of rugby under their belts Friday. Reigning National Champion Penn State had the first bye in Pool A, which has just three teams. The others, UC Davis and James Madison, battled to a hard-fought draw, with the Dukes barely reaching the try line late in the game to earn two points in the standings. Each of the four D1 Elite teams that did play Friday won their first-up encounters, with Life posting the largest winning margin of the day across all divisions, men and women, against Texas A&M. Pool mate Stanford took it to 15s Spring Champion runner-up Virginia, and Central Washington and Lindenwood both defeated their Pool C opponents five tries to one. The Men’s and Women’s DII competitions kick off Day Two in Cary prior to Women’s DI play and the third matches of Men’s DI pool play. Davenport, 15s National Champion in Moraga, Calif., earlier this month, opens the Women’s DII field against Springfield at 9 a.m. ET. Knockout play begins at 5 p.m. ET for three of the four divisions, and one Women’s DII team’s College 7s campaign will be over by the time the lights turn off at WakeMed Soccer Park Saturday evening. Every second of the competition can be viewed live on The Rugby Channel.